Home Chef is one of the more seasoned meal delivery services in the space. It has innovative menu items each week. Ordering is fast and simple, and the flexibility is awesome for those with unpredictable schedules. Fresh and natural ingredients are included with each easy-to-follow recipe that makes for a fast work to dinner transition in under 30 minutes. The food menu at Home Chef is delicious and easy to prep. The company follows the 3Rs, reducing, reusing, and recycling for their packaging and delivery plans are flexible. The company tailors your meal plans to your preferences with an intake survey then you sign up. It’s easy to find a meal plan to fit your taste preferences. It’s minor, but their webpage is a bit harder to navigate than its competitors and special diets might have a hard time finding exactly what they are looking for. Home Chef is a reliable and seasoned company that offers a flexible meal plan that is ideal for people who live a hectic lifestyle (mostly all of us, right?). You can get affordable and delicious meals like Chili-Lime Salmon, Creamy Parmesan Steak Penne or Tuscan Chicken Salad delivered to your door with the click of a button. They also lead the pack in dietary restricted options. Cooking has returned to dinnertime. People who used to order in or and stop and pick up some takeout food are not ordering a meal kit instead. Companies such as Plated, Blue Apron, Sun Basket, HelloFresh, and Home Chef offer meal kit delivery services. The customer receives all the ingredients for cooking a full meal. Everything is measured and packaged to that all that is left to do is the cooking. No more going to the grocery store or finding out halfway through cooking that you forgot to buy a major ingredient. With more than 100 meal kit delivery services available, it is helpful to look at some of the best to see what they have to offer. Home Chef delivers full meals focused on dinner. Users must join the service. A serving costs $9.95, and smoothies and fruit baskets are $4.95. Shipping charges do apply but are waived for orders over $45.00. For orders below $45, the shipping charge is $10. Customers receive an email on Mondays and are given a choice among 11 recipes. If no choice is made by Friday at noon (CST), the recommended meal will be sent. Customers have the option of pausing an account so that no orders will be sent. All packaging materials are recyclable. The service is available nationwide, but Home Chef does not deliver to all zip codes. Deliveries are available Tuesday through Friday. The menu for Home Chef changes weekly, but typically, the offering includes traditional meals such as pot roast, as well as more exotic items such as Korean fish cakes. Choices include dinner-portion salads, as well as burgers and soups. Most meals include a protein and two sides. The salads usually don’t require any cooking. Some of the choices come with bread, and others include sauces. The customer can mix and match meals to customize an order. However, individual recipes cannot be changed. The ingredients for each meal are standardized. The company charges $6.00 to open an account. Canceling an order less than 12 hours before delivery costs $15. Same-day delivery costs depend on the area delivered to. Prices can be less expensive according to the number of meals ordered. However, they are more expensive if a customer prefers a larger portion. Are There Menus For People With Dietary Restrictions With Home Chef? Members can go to the “Taste Profile” to enter their dietary preferences. Weekly meals that meet those restrictions will be among the available selections. There could be weeks, however, that have no offerings, because recipes for dietary restrictions are not always available. 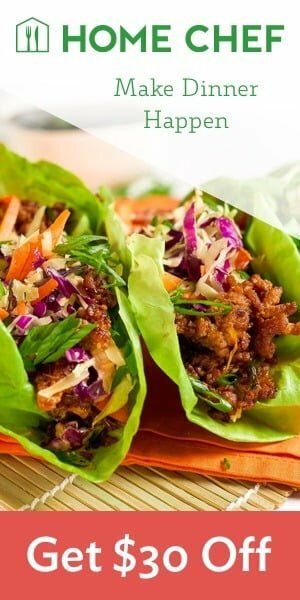 How Fresh is the Food From Home Chef? Home Chef makes an effort to use locally sourced foods and orders food as close to the shipping date as possible. The company ships temperature-sensitive foods with gel packs. These packs keep the food cold but do not freeze it. For anyone who is not home at the time of delivery, the packages are left at the door. But, Home Fresh claims the gel packs will keep the food fresh until the customer returns home later. The company does not say how long the food will remain fresh on the doorstep. Home Fresh recommends immediate refrigeration upon receiving a package. After being refrigerated, the meals can stay fresh for up to a week after they have been delivered. The recipe card with each meal makes storage recommendations and suggests how long the food will remain fresh. For example, seafood will not stay fresh as long as meats. Home Chef recommends storing the food in the original packaging. Foods should be plated immediately after cooking. Can I Try Home Chef Out First? Trying out Home Chef is a matter of signing up and ordering your first meal. New users get $30 off the first order and $10 off the second order. The customer will pay $6.00 to open a new account. Is There A Money Back Guarantee With Home Chef? Customers who are dissatisfied with a meal can request that it be replaced and redelivered, and they can request a credit to their accounts. The company does not offer to refund money. Home Chef offers a reliable service within the guidelines the company has set. Those with special dietary needs will have to gauge their experience based on the meal availability considering their restrictions. People using this service that don’t want to pay extra shipping charges will have to make their meal decisions by Friday of the week before delivery. Overall, the service, reliability, freshness, and pricing seem to be competitive with other meal kit delivery services. To get started, create an account with Home Chef on their website or mobile application. They’ll then prompt you to fill out your personal taste profile. The geniuses at Home Chef use the personal taste profile to help match you with meal selections that you might like. If you don’t like the meals they’ve pre-selected, you can easily edit your order and choose another meal option. If you prefer to skip a week or cancel your order altogether, it must be done by 12 PM CST on the Friday prior to your scheduled delivery. After your selections are made, your work is done. Simply wait for the delivery truck to drop off dinner at your door. Home Chef allows you to choose a plan that offers 2, 4 or 6 servings. Choose from dishes that are without nuts, vegetarian, without soy, poultry, without wheat, pork, seafood and more. Additional lunch options available for $7.99. Featured premium dishes may cost more. Choose from 11 recipes per week. Orders over $45 have free shipping; under $45 cost $10. The customer support team at Home Chef is available for questions Monday through Friday from 9am-6pm CST and on Saturdays from 10am-2pm CST. Sunday they are closed for business. Other services available to customers include gift cards, recipes, affiliate programs and access to “The Table,” Home Chef’s blog. Expensive but convenient and flexible for our family to get delicious meals to prep each week.